DPT pool tables are hand-built in the UK using the finest materials. We carry the entire range, with all the the lowest prices. Finance available, subject to acceptance. DPT Pool tables are built in the UK to a very high standard by an expert team based in Liverpool. DPT Pool have been manufacturing pool tables for over 30 years and are one of the largest pool table manufacturers in Europe. DPT specialise in the production of quality pool and snooker tables, and their extensive line of products includes English pool tables, American pool tables, pool dining tables and outdoor pool tables. Some of DPT's tables rank among our most popular products, including the iconic Omega Pool Table and the Majestic Pool Dining Table. 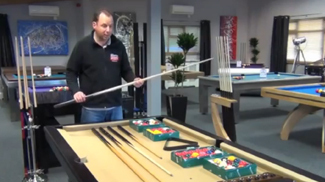 These are expertly-made pool tables, representing the level of quality you can expect from Home Leisure Direct. DPT Pool and Snooker is a family business whose focus is on producing affordable slate bed pool tables, without compromising on quality. This allows you to get cheap slate pool tables that play well, look good and will last a very long time. Our DPT pool tables all come complete with free delivery and free accessories, so you have all you need to get started once you receive your table. These accessories include two cues, a set of balls, a triangle and chalk, so with no extra cost you'll be enjoying a game of pool on a fantastic new table. With the Majestic Pool Dining Table, you can get the best of a pool table without sacrificing space, since the table doubles as a dining surface with the supplied hard top. This has proven an extremely popular choice with customers who don't quite have the space to dedicate to a pool table, and means that pool is now a possibility at home even if you don't have a spare room. Our range of DPT pool tables is available with a huge choice of finishes, sizes and cloth colours. All DPT tables have slate beds and are made to DPT's exacting standards, meaning a DPT table is a fantastic and reliable purchase, offering you a great game of pool on a table that will last for many years to come. To give you that extra layer of reassurance, DPT tables come with an incredible 12 month warranty against manufacturing defects. DPT's pool tables are manufactured in either 6ft, 7ft or 8ft size, ensuring you can get the right table regardless of how much space you have. Among the 8ft tables, the Omega is one of our most popular models, and it's easy to see why. Affordable and attractive, as well as customisable, the Omega offers amazing value for money and looks great too. All DPT tables are fully customisable and come in a great range of finishes and cloth colours. If you can't find exactly the cloth colour you want in their standard range, we can supply Smart Cloth by Hainsworth, or one of our huge range of logo cloths, which include football club logos, Jack Daniel's or any printing of your own design. If you need any help choosing your perfect table, or deciding on colour schemes and finishes, please give one of our expert advisors a call and we'll be happy to talk through all your options. If you are looking for some expert advice, either on DPT Pool Tables or on any of our other products, please just give our friendly team of advisors a call on either our freephone number 0800 622 6464, or on our main line number 01454 413636.